Maximum homemade pita filled goodness. In a large bowl, add the ground turkey, granulated garlic, onion powder, dried oregano, cumin, red pepper flakes, dried parsley, dried dill, salt and pepper. With clean hands mix the meat mixture together. Try not to handle the meat too much (or the texture of the meat could become dense). Form the meat into 4 kabob-like shapes. Heat a large non-stick skillet on medium heat and add olive oil. Carefully tilt the skillet a little bit to spread the olive oil around the bottom of the pan and add the ground turkey "kabobs" to the pan. When the bottom sides of the meat are browned (about 5 minutes), using a spatula turn the meat over to the other side. Cover the skillet with a lid and let cook for another 5 minutes or until the meat is thoroughly cooked. Be careful not to overcook the meat or it will be on the dry side. Transfer the meat to a plate and let it sit for a few minutes to rest and seal in the juices. Sprinkle pepper on top of the tomatoes and set aside for a moment. Spread mayonnaise on one side of each pita. 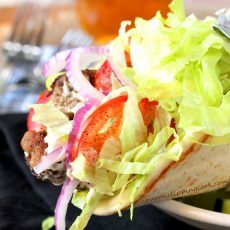 Top each pita with 2 ground turkey "kabobs". Add the tomatoes, onions, and lettuce. Lightly drizzle olive oil on top of the meat. Add a dash of salt and pepper on top, fold the pita into the shape of a taco and serve.